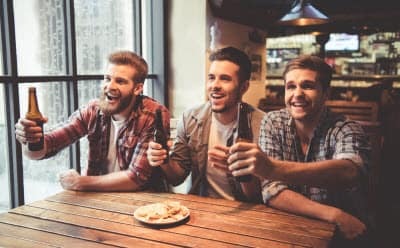 With the end of football season comes the playoffs, and when things come down to the finals, you’ll have to decide where to watch the big game and how to celebrate with your friends. There’s lots of places to go in the area for a fun and exciting viewing experience. 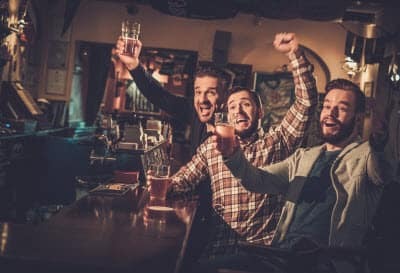 These are the best sports bars to watch the big game near White Plains, NY. Alex Lounge Bar & Grill offers everything from classic bar fare to traditional Mexican cuisine and specially crafted tropical cocktails. Mango, strawberry, and classic margaritas are always a favorite, as well as the empanadas, tacos, chicken wings, chips and salsa, and burgers, making a perfect, delicious spread for game watching. The bar often hosts live Latin music and DJs, so you can enjoy an evening of good food, drinks, and dancing – occasionally a whole night will be dedicated to salsa dancing! A variety of delicious appetizers and select drinks are on the special sports bar menu for the duration of football and basketball season, making the Brazen Fox a no-brainer for game watching. Grab some bites from the bar for your buddies, like the mozz knots, mini meatballs, pigs in a blanket, or corn fritters. Select beers and pitchers are available for special prices, so grab some brews for all your friends. For the more sophisticated sipper, there’s also a whole menu of signature cocktails, which features a variety of fruity and delicious concoctions. At Emma’s Ale House, you’ll find a menu of yummy comfort food classics in a warm and comfortable setting, named for the owner’s beloved yellow lab. The menu is full of items such as fish and chips, barbecue braised short rib, chicken pot pie, buttermilk fried chicken, and more. A selection of 10 carefully chosen beers are on tap, too, and the bar has been the recipient of numerous awards. Gather your friends for a delicious, comforting meal, and then grab a brew at the bar to watch the big game!